Exfanding Your Horizons: Waiting for Wednes--er--Thursday! So, every now and again a national holiday pops up on a Monday, and Diamond's shipping schedule gets adjusted, and new comics ship later than usual. 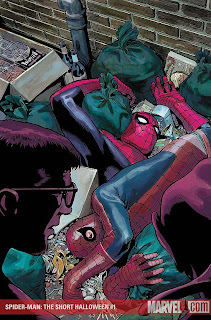 With this past weekend's Memorial Day holiday, that's exactly what's up, and it's why if you walk into your comics shop today, there will be no new comics. And you'll probably get laughed at. New books will be on store shelves tomorrow (Thursday), but since I like tradition, I figured I'd go ahead and do a Waiting for today. It's a pretty heavy week, what with it being the end of the month and all, so be prepared to spend some dough tomorrow. First up we have a book that I'm pretty stoked about. Do the kids still say "stoked"? Anyone know? Anyway, the book is called Spider-Man: The Short Halloween, and it's written by comedians Bill Hader (Saturday Night Live, Superbad, Forgetting Sarah Marshall) and Seth Meyers (SNL)! Hader and Myers are both unabashed comic book fans (Hader claims he can do a dead-on Neil Gaiman impersonation) and I really can't think of a better character for these two comedians to write. On art chores is the great Kevin Maguire, whose ability to draw facial expressions is unmatched in comics. Two stars of Saturday Night Live make their Marvel debut with an all-new story set right on the bustling, hot dog juice covered streets of New York City. Halloween is coming early this year as Spidey is knocked out during the Greenwich Village costume parade and an intoxicated reveler in a Spidey costume takes his place. Really, we don’t want to say more than that. Trust us, with comic book legend Kevin Maguire (JUSTICE LEAGUE INTERNATIONAL) along for the ride, this’ll be more exciting than putting a president on a comic book cover! As all of us big dorks know, the title is a play on Jeph Loeb and Time Sale's famous Batman story, The Long Halloween. Now, beyond that, I don't know much about the project. But I'm a fan of Hader and Meyers, and certainly Maguire, so this is a must buy for me. Next up, we have another one of those books that I've talked about in the past but feel compelled to mention the title again. Simply because it's just that good a book. 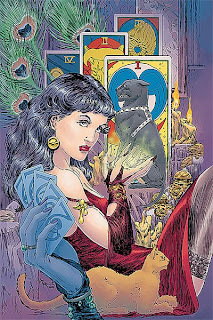 Tomorrow sees issue 11 of Vertigo's classic-in-the-making Madame Xanadu series, written by Matt Wagner. Master illustrator Michael Wm. Kaluta jumps onboard for a 5-issue story with the seductive sorceress he first brought to life 30 years ago. Kaluta joins series scribe Matt Wagner to weave a mystery that jumps between the Spanish Inquisition and 1940s New York City. Long-buried secrets come back to life as Madame Xanadu investigates a murder 500 years in the making. Featuring colors by Eisner Award-winner Dave Stewart. If you're a fan of fantasy or magic, or history, this book should be atop your reading pile. It's a centuries-spanning tale that jumps from important historical event to important historical event, and it's just a flat-out well-written and beautifully drawn comic book. Go! Buy! Finally, we have two recommendations in one! First, we have the long-delayed, and highly-anticipated, conclusion to David Petersen's epic Mouse Guard: Winter 1152 mini-series. The second volume of Petersen's Mouse books, Winter delivers another beautifully drawn, satisfying read that mixes high action with deep emotional responses. With the food and medicine shortage still unresolved, hares and riders depart from Lockhaven, but not to redistribute food throughout the territories; instead they ride on a desperate search and rescue mission for Celanawe and Lieam, still unaccounted-for. A dramatic climax as this final chapter of Winter 1152 sees the mice honoring the death of one of their own. Now, this is the final issue of the mini, and if you haven't read any of the previous issues, I'd wait for the trade. 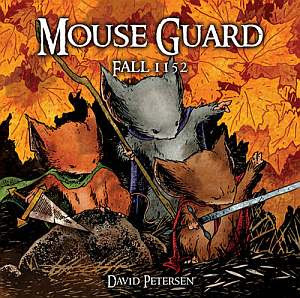 Further, if you haven't read Petersen's award-winning first volume, entitled Mouse Guard: Fall 1152, I suggest you run out (right now!) and buy it. Seriously, it's that good. Here's a distinct comic book image: mice with capes and swords defending themselves against their predators as if they were the Knights of the Round Table. It's a gimmick, but one that Petersen plays completely straight. His art is a perfect mix of the realistic and the fantastic: the mice and other animals always look realistic no matter how adventurous the situations get, including facing snakes and crabs in the first two chapters. Petersen doesn't let things get overly cute, either. These mice are fierce, dedicated fighters, and the violence their job entails is not forgotten. While the book always looks good, the story is pretty thin. The action is never boring but in the beginning it never moves the plot forward. Soon a plot about a traitor in the guard kicks in, leading to some exciting moments covered too briefly, and the character development is thin as well. Luckily, the art makes up for the storytelling shortcomings—Petersen's character designs are enormously appealing, and the book is hard to put down for that reason. The story is suitable for all ages, and kids in particular should enjoy this adventure. And, while I don't agree with the entirety of that review, I do heartily recommend this series as a great way to get younger readers into comics. It's more violent than, say, Jeff Smith's Bone series, so be careful on that front, but if you have kids in the family, do yourself a favor and check this book out. I have the first volume in hardcover, and with the incredibly long delays (due to problems with the publisher) on this current series, I will be picking up the Winter trade when it ships. Check it out--I think you'll enjoy it. And that's all I've got today. How 'bout you--what are you Waiting for?